If you are a muffin lover then you have come to the right place. If you are a banana lover then you have come to the right place too as your favorite banana is going to get an awesome makeover soon and you are gonna love it! And if you are a banana muffin lover then I just have no words to express what I am feeling inside! The humble-looking over-ripe bananas, which you were about to throw out because no one in the house feels great about it, are going to transform into something which is simply to die for! And yes you are right! They are nothing but some absolutely delicious super moist and super flavorful banana muffins! Preheat your oven to 180⁰C/350⁰F and place the wire rack in the middle of the oven. Line a 12 cup muffin pan with paper liners. In a large bowl, mix together all the dry ingredients – flour, sugar, baking powder, baking soda, salt, and cinnamon. Give a gentle stir with a wire whisk. In another large bowl, mix melted butter, mashed banana, eggs, and vanilla extract. With a rubber spatula or wooden spoon, lightly fold the wet ingredients (banana mixture) into the dry ingredients just until combined and the batter is thick. Do not over-mix as that would lead to a tough bread. Just mix it until everything seems to be incorporated and a homogeneous mixture is reached. Spoon the batter into the prepared muffin tin making each ¾ full. You can use an ice cream scoop for this as I do and I smear some oil inside the scoop so that the batter falls off easily. Bake the muffins for about 20-25 minutes or until a toothpick inserted into the center comes out clean. 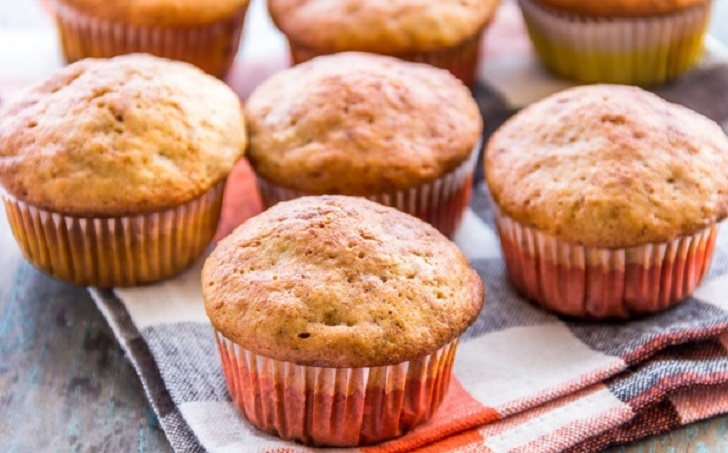 If you feel the tops of your muffins are not brown enough, just shift the wire rack with the muffin tin to the lowest rack and turn on the broiler for just 1 minute or until the tops are browned. Do not leave the oven unattended at this point as a few seconds delay can turn your beloved muffins from delish to disaster!